Bloodchain belongs to the transports and logistics sector. The members of the group that co-created this prototype were Cat Drew (Uscreates) and Robbie Bates (Uscreates) as lead designers, and Travin Keith (Agavon & Member Representative Hyperledger), Mika Lammi (Kouvola Innovation) and Marcella Atzori (University College of London) as expert stakeholders. The group started their prototype development by reflecting not only about the contexts where supply chains needed strengthening, but also where this strengthening would help to tackle already existent social issues. As such, blood donation and all the logistics involved in its system were chosen as their use case. This pick was based on the shortage of voluntary donations in a country such as the UK, and above all, on one of the underlying motives for this shortage. Blood collection still happens sporadically, when someone has the motivation and time to go out of their way to visit a blood donation centre, often only located in hospitals, or at best, in mobile donation units. According to the group, an integrated supply and demand management system enabled by blockchain technology could help to address this issue in two ways. 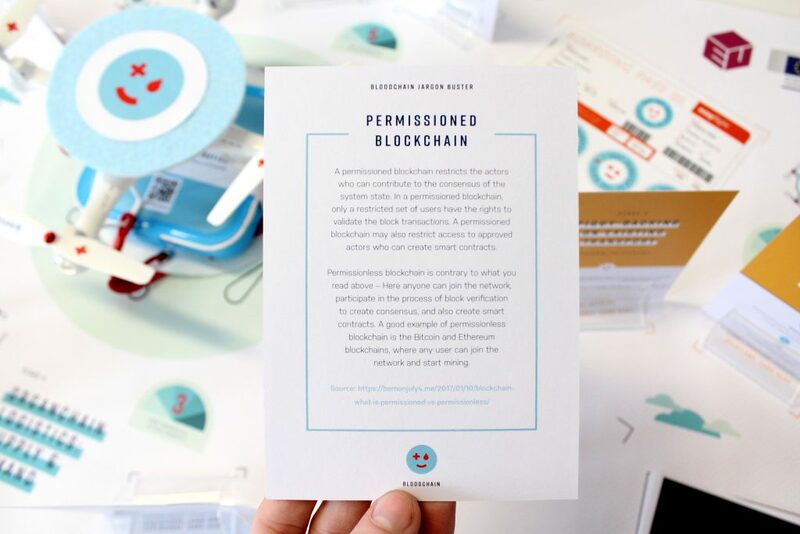 ‘Permissioned Blockchain’ Jargon Buster card. First, it would allow people to securely register their blood types into a distributed blood bank that could manage supply and demand in real-time. Call-outs across the system would be made when particular blood types were in need. The use of a permissioned, multi-chain structure, such as Hyperledger Iroha, could maintain people’s privacy until after they had consented to a particular donation, and otherwise keep their blood type separate and unlinked from their personal ID. Moreover, AI applications running on the top of the data would be able to foresee the future demand for blood, for instance in hospitals, and prevent in time the exhaustion of blood stock. Second, it would allow the deployment of an autonomous fleet of drones to be sent out to people’s homes, in order to remotely collect the blood and return it to the hospital for checking and onward use. The blockchain would allow optimisation of drone workflows, making sure they are in the right place at the right time, and verification of their journeys to and from donors’ homes. This would reduce infrastructure costs, create savings in public expenditure, and reduce CO2 emissions. Another potential use case, Organchain, was also developed within the same scenario to showcase a similar backend demonstration of how the technology might actually work in practice for the transport of organs. Information about this use case is available in the additional materials for download at the end of this page. The Bloodchain prototype includes both digital and non-digital artefacts across five stages: Sign-up, Blood Collection, Piggy-backing, Logistics, and Fleet Management. The prototype is meant to simulate how it would work in a real life scenario, thus encouraging people to think about the implications of a blockchain-enabled system for the transport of highly sensitive materials. Home blood donation kit and blood sample. Within the first stage, Sign-up, we find a paper based set of cards that simulates the various stages of a user signing up to the Bloodchain system. The process has been designed to include the technical details of how blockchain would be an integral part of this sign-up process for potential donors. 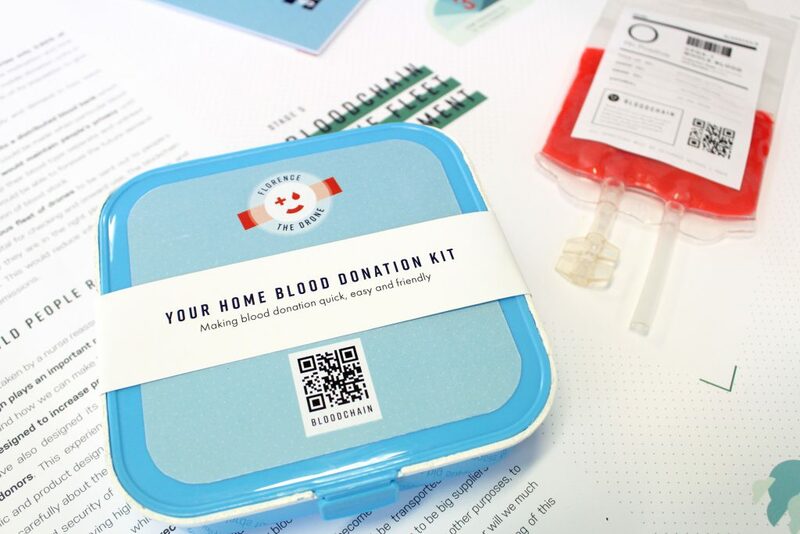 The prototype showcases the front-end experience of becoming a donor and donating blood. The second stage, Blood Collection, has a drone mock-up at the centre, Florence. It is designed to assist and take blood at home, once the donor completes the sign-up process. The drone includes a soft and ‘friendly’ aesthetic to encourage people to donate. It also includes a mock-up package to simulate some of the medical utensils that would come with the drone to allow people to take their own blood at home. In the third stage, Piggy-backing on Existing Transport, the prototype moves a step further. A plane ticket and stickers bring to life the idea of ‘donating at the gate’. The point is whether beyond its own transportation means, Bloodchain could also piggy-back onto existing transport such as commercial flights, to more efficiently meet demand for blood donation. As example, if a major accident happened in Madrid, for instance, people travelling there would be encouraged to donate whilst waiting for their flight. That blood would be registered on the Bloodchain system and later transported in the same flight. The stage number four, related to Logistics, contains the main interactive piece of the Bloodchain prototype. It comprises both a back and a front end, that is, a functional blockchain system and an app that allows interaction with that system. Additional information is available below in the additional materials, with the app accessible for download. Bloodchain mobile app in beta development. Accessed via a tablet this app gives a basic demonstration of how people could sign-up and use not only Bloodchain but also Organchain. It includes first a Donor Registration Step, where users submit personal and medical information to the system with an encrypted key, and where participating hospitals running nodes are able to see these properties being set and can set up an internal notification system should the desired blood type and other key data be added to the system. Afterwards, it comprises the matching of the hospital request and donor offer based not only on compatibility criteria but also on both actors’ interests. And finally, it contains the drone blood collection and return: each drone is pre-fitted with their own account on the Logistics chain, the hospital has approval permissions on the transfer request, and the donor’s access to notifications guarantes the safe arrival of their blood. The blockchain systems used for this prototype architecture are Hyperledger Iroha, which primarily handles the identity management of each patient, as well as Ardor, which primarily handles the logistics around the transfer of blood and organs. Part of the need for having two blockchain systems for this architecture is to further protect the privacy of each patient, as well as to allow the logistics chain to remain unaffected if ever the identity chain needs to have information completely removed. Finally, in the prototype’s fifth and last stage, there is Bloodchain Drone Fleet Management. 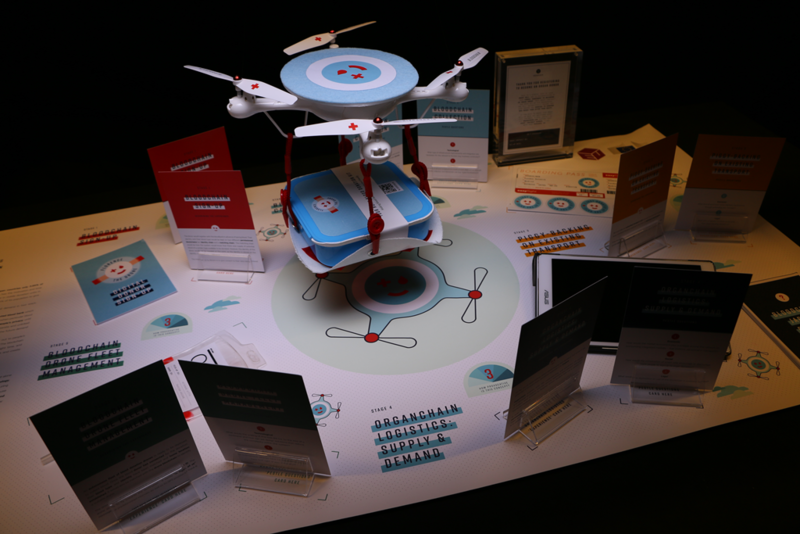 Here, a specific artefact aims to showcase and describe how the blood donations and the drone are managed and monitored using chips and QR codes. That artefact is a mock-up blood bag with mock-up donated blood, which includes a code that the donor must scan via the Bloodchain app to register their donation and validate the legitimacy of their donation. Through Bloodchain, multiple questions and provocations are meant to be explored and discussed. The most immediate one, perhaps, is how would people react to it. People don’t often like their blood being taken even by the most reassuring nurses, so how would they engage with a scenario where giving blood might happen via an autonomous drone? Bloodchain has been designed to increase privacy and trust into the system through the use of blockchain technology, and it was also designed to provide a reassuring and convenient experience for blood donors. But following this same road, the group poses questions such as what kind of responses should be also prepared, from policy to behavioural dimensions, so that systems as Bloodchain could be adopted in the near future? In this scenario, blockchain technologies could enable privacy for donors to the bloodbank, and security of transport, thus addressing issues such as system integrity. However, people could also want to know if this technology is full-proof. Digital systems carrying highly sensitive material cannot be allowed to fail as it would compromise their life-saving activity. The nodes which run the network and validate transactions need to guarantee business and service continuity, disaster recovery, financial stability and preservation of data. 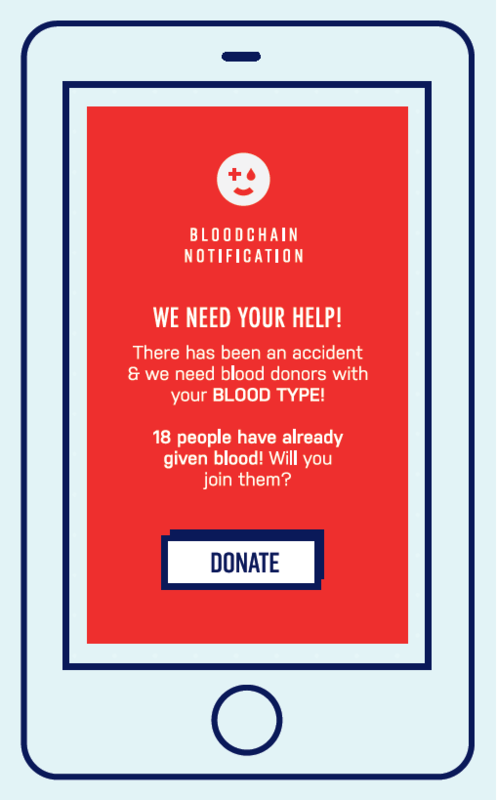 Bloodchain aims to put the emphasis on a balance to be struck between making blood donation easy, attractive and socially rewarded, and the potential monetisation / tokenisation of the service. Regulation would be needed not only to ensure standards for blood between different EU countries, but also how donors might be incentivised to provide blood. As transport and logistics companies think about how to expand into other areas, these issues become more acute. In this case, what would blockchain for organ donation really look like? 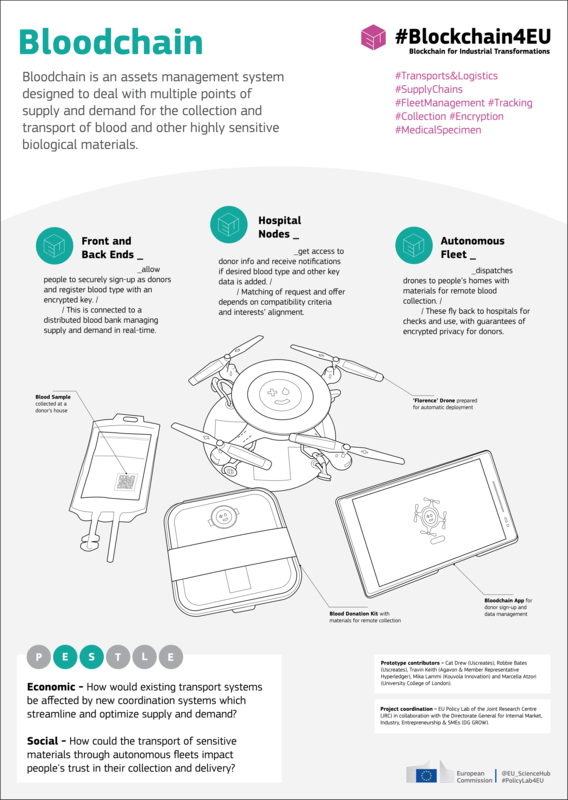 Where would it be more likely that blood or organs are transported not just by drones, but by a distributed network of multiple transport carriers? Do all of those have to be big suppliers and contracts? How can we all take advantage of the transport that is taking place anyway and for other purposes, to ensure efficiency? And will this all be obsolete with the creation of synthetic blood and organs? Or will we be able to better match up demand with supply, also through a better commissioning and manufacturing of this material on demand? Bloodchain stages and elements on the prototype’s system map. Bloodchain, Organchain, and their respective text, design, audiovisual, and code elements are made available by the EU Policy Lab of the Joint Research Centre under a EU Public Licence (EUPL), and where not applicable under a Creative Commons Attribution-Share Alike 4.0 International (CC BY-SA 4.0), unless otherwise stated. The app architecture was developed under previous licensing schemes but is kept open and made available for dissemination purposes, under the Apache 2.0 License for Hyperledger Iroha elements, and the Jelurida Public License for Ardor elements. You can use, redistribute and/or modify the whole or parts of the available material under these terms “as-is”, as long as you note the licenses and attribute credit (European Commission, Joint Research Centre, lead designers, other contributors). This is without warranty and declared fitness for any particular purpose, and disclaiming liability for any consequences resulting from using, redistributing and/or modifying any of the provided elements in any given circumstances.